"Okonomiyaki is a Japanese pancake stuffed with yummy goodness! 'Okonomi' means what you like and 'yaki' means grilled. 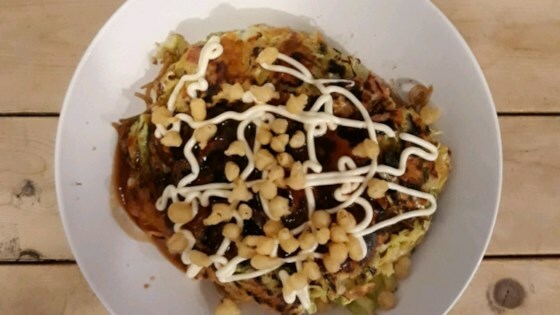 The ingredients provided are the basic okonomiyaki recipe. Feel free to add any vegetables or other meats. Have fun playing with the ingredients!" Mix flour and water together in a bowl until smooth. Stir in cabbage, bacon, eggs, sausage, green onions, shrimp, cheese, and tenkasu. Preheat a griddle to 400 degrees F (200 degrees C); coat with oil. Pour in flour mixture in the shape of a pancake. Cook until golden brown, about 6 minutes per side. Transfer to a serving plate. Mix soy sauce, ketchup, and vinegar together in a small bowl to make okonomiyaki sauce. Drizzle over pancake. Garnish with panko and mayonnaise. For a spicy okonomiyaki sauce, add cayenne pepper. Substitute crumbled saltine crackers for the panko bread crumbs if desired. Would love to see a pic?